Numerous scientific agencies on both sides of the Pacific detected an earthquake Saturday near the site where North Korea set off a hydrogen bomb earlier this month, at first prompting speculation of another weapons test, before a consensus appeared to emerge that the tremor was a natural occurrence. Xinhau, China's official news agency, said the country's seismic service registered a 3.4 magnitude event that it originally viewed as "likely caused" by an "explosion." Later, the China Earthquake Administration revised its estimation, saying the quake was not a nuclear detonation. 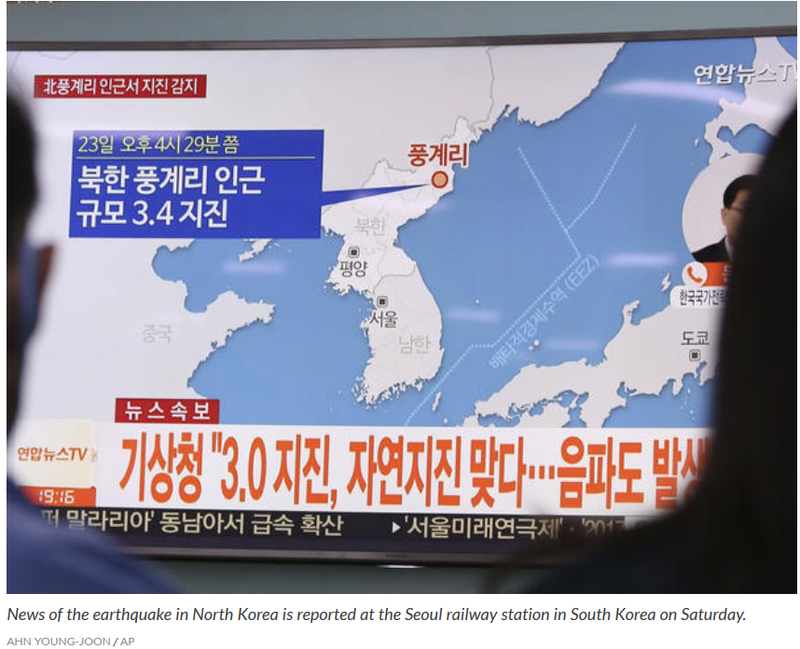 South Korea's presidential office said in a statement that a handful of its government agencies "still maintain [the quake] was natural and not from an explosion." The president's office did add that "analysis is still ongoing so we will keep you posted." The Comprehensive Nuclear-Test-Ban Treaty Organization, through its executive secretary, tweeted Saturday that the activity was "unlikely man-made." The United States Geological Survey was neutral in its assessment on the cause of the tremor, which it recorded as a 3.5 magnitude quake, saying in a statement that it could not "conclusively confirm at this time the nature (natural or human-made) of the event." For reference, the U.S. agency recorded a 6.3 magnitude quake after North Korea's hydrogen bomb test on Sept. 3, its sixth of a nuclear weapon. Saturday's seismic activity came on the same day China announced it would limit trade with the North, reducing its fuel exports to its neighbor and banning all textile imports. On Thursday, the U.S. unveiled its own set of economic sanctions targeting North Korea. The quake also caps a week in which President Trump and North Korea leader Kim Jong Un exchanged increasingly bellicose insults toward each other and follows a threat on Thursday by the North to carry out a significantly more dangerous nuclear test. In comments to reporters in New York, North Korea's foreign minister said his country's leader is considering whether to demonstrate his ability to detonate a nuclear warhead aboard a missile sent above the Pacific Ocean. So-called atmospheric tests of nuclear weapons were banned by the U.S., the then-Soviet Union and many of the world's nations in a 1963 treaty, though China conducted the last such test known worldwide in 1980. Atmospheric tests of nuclear-armed missiles, as NPR's Geoff Brumfiel reported, are dangerous for a host for reasons, including the potential for sending nuclear fallout in unpredictable patterns and, if a test were to be administered by North Korea, in the direction of the U.S.
Until now, the North has not tested its missiles and nuclear weapons together, opting instead to fire them separately — the missiles above ground and the nuclear weapons below. After a week in which through tweets and a speech before the United Nations General Assembly, Trump introduced the derogatory nickname "Rocket Man" for Kim into international news coverage and left open his prerogative to "totally destroy" North Korea, the president gave no ground on Friday in his public standoff with his adversary's leader. During a campaign rally for Alabama Sen. Luther Strange, Trump lashed out against Kim, telling the crowd, "we can't have madmen out there shooting rockets all over the place." "Rocket Man should have been handled a long time ago," he continued amid cheers from the audience. "He should have been handled a long time ago by Clinton — I won't mention the Republicans, right — by Obama." The president assured those in attendance, without details, that he would defend the U.S. against any offensives launched by North Korea: "I can tell you one thing, you are protected, OK? You are protected. Nobody's going to mess with our people." A day earlier, Kim reacted to Trump's provocative speech at the U.N. by equating the U.S. president to "a frightened dog" and a "mentally deranged U.S. dotard," employing an obscure insult for someone declining into senility.